And I haven’t written for a while… again. I got to put myself on a schedule or something! Anyway, I’ve been reading and listening to audio books so much lately that I can’t just pick one favorite so instead I’ve picked a author whom I’m interested in at the moment and that author is Wendy Mass. The books I’v read by her are mostly mysterious and funny… OK, really funny. Like in the book I described last month, Finally,the book starts with Rory stuck in a drain pipe. Yes, a drain pipe. 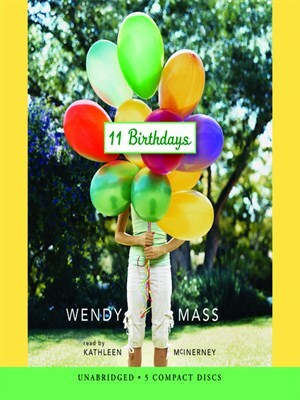 The next book I’ve read (or listened to) by Wendy is 11 Birthdays. About a girl whose eleventh birthday doesn’t go as well as planned, which is pretty much OK…until she relives her birthday again and again and again… which leads to an adventure to end it. 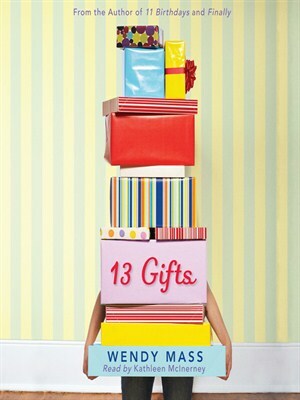 The last book I’ve read so far is 13 Gifts. About a girl who visits the mysterious town of Willow Falls and discovers many new secrets about the town and her family. The next Book of the Month is about a family of mice (or mouses! (; ) who are at risk and after asking the wise owl, end up getting help from smart (and scary to a mouse) rats who live under the rose bush. If you think you know the answer, please leave a comment by July fourth.